Filtre Studio and award-winning photographer Andy Goodwin created a fun series of images illustrating improbable scenes of Her Majesty engaging in "everyday" activities. 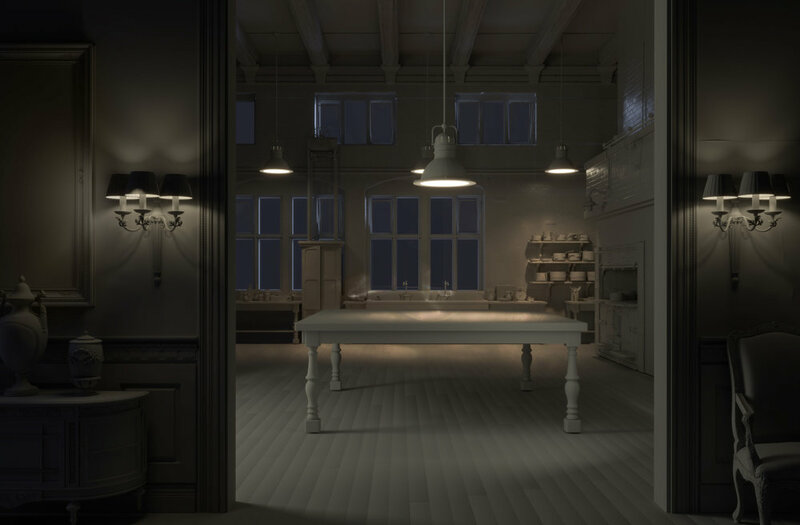 Studio shots of talent were placed into a room created entirely in CGI. Given the ornate nature of the palace interior, the incredibly complex 3D geometry of the scene consisted of over 200 million polygons. This is the first part of a bigger project that we call “Lesser Known Moments in History” that will feature famous people in unexpected situations. After weeks of planning and brainstorming ideas with talented photographer Andy Goodwin, we set about creating this entire room in CGI. The complex interior was modeled right down to the intricate moulding details. Care was taken to ensure that everything was believably represented, not only in camera view, but also within the reflections of the several mirrors in the room. We created numerous types of materials, ranging from the wool rug, to the extensive decorative gilding in the room. A true collaborative effort, none of this would have been possible without the fantastic team that helped pull it all together. Thank you Hannah Soto for producing (“You want a queen and some corgis? No problem!”) Lavi Toma for props and wardrobe (“I couldn’t find the perfect queen hat, so I made one”), hair and makeup by Kasha Rodig, and photographer’s assistants Jack & Tom (“I’ll stand-in AND wear the wig”).